Celebrated for its award-winning design. Revered for its engineering innovations. Admired for its versatility and class-leading performance. 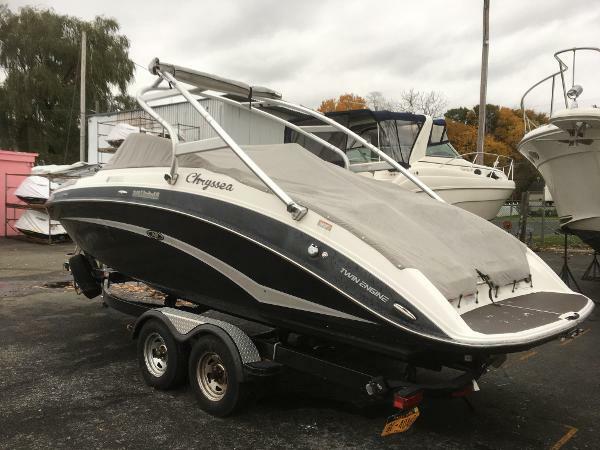 Highlighting the stylishly-assertive profile of this luxury craft is a bold, forward-swept folding tower, while at the heart of this cruiser are twin 1.8 liter Yamaha Marine engines, engineered for maximum reliability, fuel efficiency and breath-taking performance. 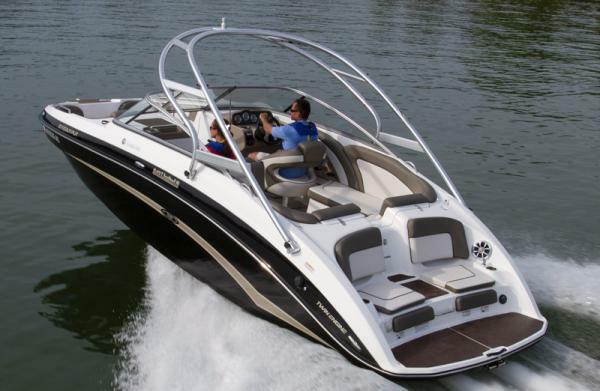 Yamahas flagship 242 Limited S delivers a truly indulgent boating experience. Hull Color champagne, In stock. 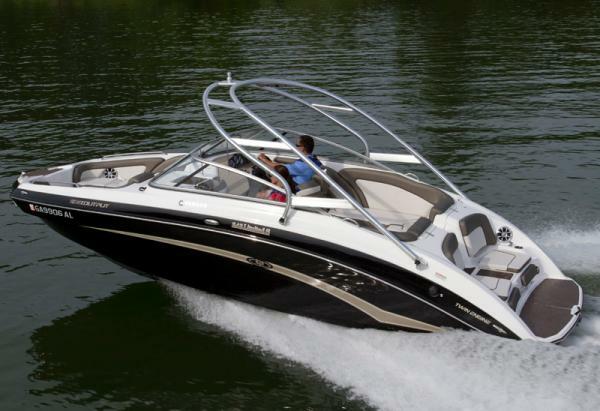 The flagships of the Yamaha boat line offering the highest level of refinement Yamaha offers. New thrust directional enhancer for improved slow speed handling. 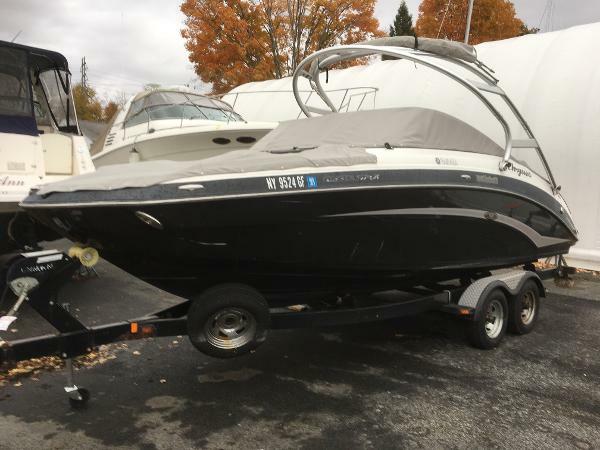 Twin 1.8L Yamaha marine engines. Expansive bow seating that features front-facing rumble seat design. Latest version of Yamahas award-winning stern lounge and swim platform design. 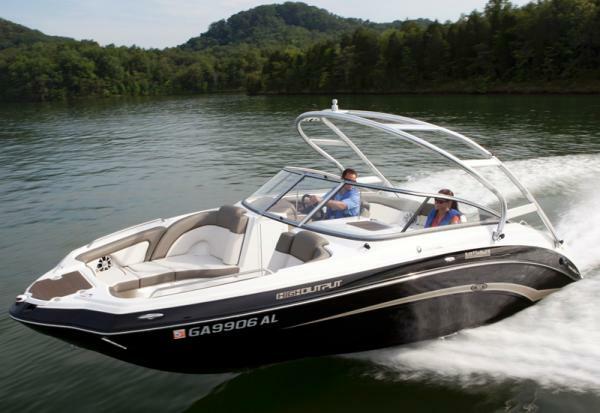 GPS instrumentation, Cruise Assist and 3-speed No Wake Mode. 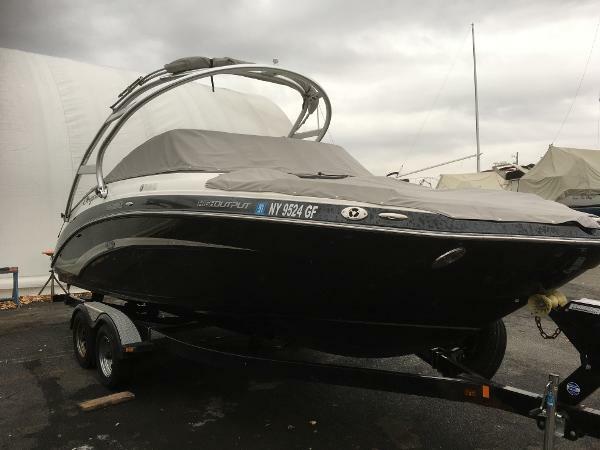 Returning as the best selling model in its class in 2011 is the feature-rich Yamaha 242 Series that takes Yamaha boats to its highest level of sophistication and refinement. 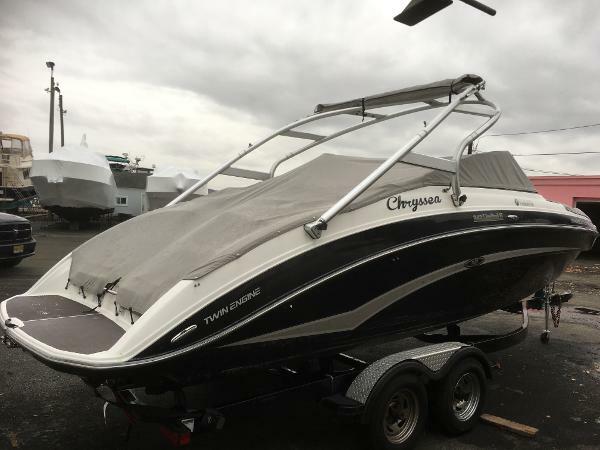 The flagships of the Yamaha boat line, the Yamaha 242 Series includes the 242 Limited and the 242 Limited S. The 242 Limited S is the watersports edition of the series that now includes a premium fold-down aluminum tower with integrated cockpit lighting and speakers. Above the waterline, the tall freeboard of the 242 Series gives the 242 Limited and Limited S an impressive profile. The seating area at the bow is wide and long allowing the tallest passengers and multiple riders the space to stretch out and lounge while moored. Insert the standard bow filler cushion and you have one of the largest, most comfortable bow seating configurations available in its class. Exclusive to Yamaha boats is the industrys first and only rumble seat design, a fun and innovative seating option that allows riders in the bow to enjoy a unique, front-facing point-of-view in the forward-most part of the bow when underway. 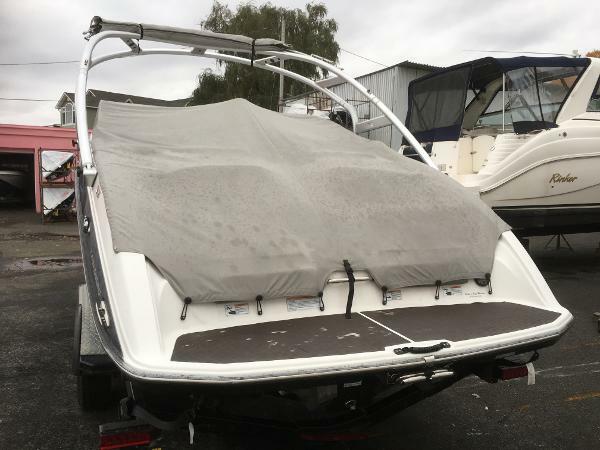 Completing the bow is premium marine-grade upholstery, stainless-steel handrails, 4 stainless steel cup holders, multifunction filler cushion, a bow ladder, anchor locker, and bow docking lights (242 Limited S only). The cockpit of the 242 Series is roomy, lavish, and refined. The helm layout is minimalist and sophisticated with large analog gauges and integrated digital information displays that provide independently controlled access to a wide range of new information. Utilizing an integrated GPS-based information control center, the digital displays can provide latitude, longitude, compass heading, elevation, water depth, trip odometer, clock, engine hours, engine speed, vessel voltage, vessel speed, highest speed, fuel level, fuel used and they are the first in their class to provide real time (gallons per hour and miles per gallon) fuel flow data. Also at the helm is Yamahas exclusive Cruise Assist and No Wake Mode. The Cruise Assist feature can be engaged at planing speeds. When engaged, Cruise Assist will hold the engines at a specific RPM for effortless cruising or towing and can be increased eight positions up and eight positions down at pre-set increments (125 188 rpm depending on current engine speed). The No Wake Mode includes three different RPM settings allowing the driver to easily increase or decrease their no wake speed to find the optimum setting. Completing the helm is a premium stereo system with direct plug-in iPod® connectivity inside the unit. When the iPod® is plugged into the stereo, it will charge automatically and can be controlled entirely through the stereo controls, as well as the remote control on the swim platform.